then pace the plane for a “long period”. Since the source of the information came from the USAF, it appears a trip to the Blue Book files might be more helpful than the NICAP document. 2. The plane’s altitude was 7500 feet. 3. The plane was on a heading of 154. It is not stated if this was magnetic or true (the magnetic declination for Tunis was about +2 degrees). 4. True air speed was 170 knots. 5. Position of the aircraft was 39 degree 40 minutes north and 11 degrees 30 minutes east when the object was first seen. 6. The UFO was seen off of the right wing of the aircraft (starboard side). 8. According to the air crew, the object was observed to “rise and descend” and “approach and retreat”. 9. The longest duration of observation was 55 minutes. 10. Four of the air crew was positive it was not a star. The other two did not give a conclusion. 11. There was some light scud clouds in the area at the time of observation. towards Tripoli. The lati- tude may be in error and it probably was 35 or 36 degrees and 40 minutes north (Probable position marker in the image). For the most part, it really does not matter if this position is correct. The most important aspect is the heading and the po- sition of the UFO relative to the aircraft. More confusing is that we don’t know if the time given was the start or the end of the sighting. If it ended at 2045Z, we could give a better identification of the potential source. However, if it started at 2045Z, then the event would have ended around 2140Z. Blue Book decided that the pilots and air crew mistook the planet Venus for this UFO. I can understand how Hynek might have chosen Venus but I am not sure where they got the azimuth of 200 degrees. Ninety de- grees from 154 is 244 degrees. The planet Venus is a commonly mistaken object for a UFO and it does appear to exhibit the characteristics mentioned by the air crew. The C119 aircraft was a propeller driven plane that was flying at an altitude where they were exposed to the weather. The plane probably bounced around a bit giving the impression of an object that was still to “rise and descend”. The approaching and retreating of a celestial object is also not unheard of especially when there are clouds that would interfere with the object’s bright- ness. It’s brightening and dimming would make it appear to come forward and descend. Finally, the “pacing” of the aircraft would be what one would expect. As long as the plane flew on a consistent course, the celestial object would appear to be in the same location relative to the aircraft (see image below of Jupiter off the starboard wing of an airliner). The big question is, “Was Venus in the proper position to produce this report”? The answer to that one is made difficult by the time given. Venus was at an azimuth of about 276 degrees at 2030Z (see image below left). However, it was at an altitude of one degree and set around 2040Z, five minutes before the sighting either ended or started. If the 2045Z time was the end of the sighting, it is still possible that Venus might have been responsible. This would assume that the time reported was slightly in error or that atmo- spheric refraction/altitude of the aircraft allowed Venus to be seen for slightly longer before it set for the air crew. The heading of the aircraft and the relative location of the UFO to that heading indicates they were looking west , where Venus and Jupiter were located. As one can see in the diagram above, viewing from the side window towards the right wing, is at a relative bearing from the front of the aircraft of about 110 to 120 degrees. 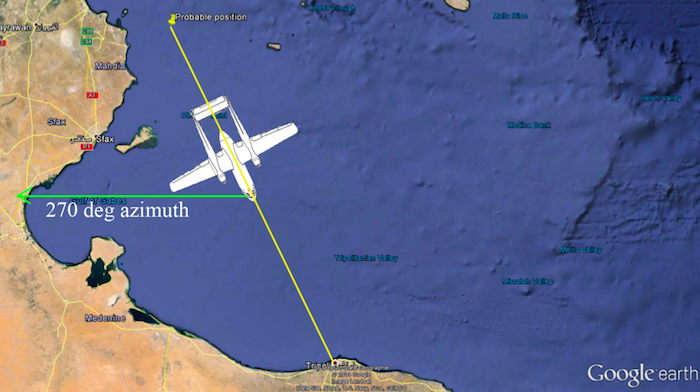 This corresponds to an azimuth of around 270 degrees if the plane was on a true heading of 154 degrees towards Tripoli. This appears to indicate that the culprit was Venus or Jupiter. There seems to be good reason to suspect that this UFO was either Venus or Jupiter. It is too bad that Blue Book did not inquire to gain more specific information to work with such as the beginning/end time of the sighting. Hynek seemed to be confident it was Venus so he may have inquired about this detail and it was not recorded in the file. In either case, both would have fit the description given by the air crew as both would appear to be pacing the plane off the starboard side of the aircraft. The fact that Jupiter or Venus was never mentioned by the crew tends to increase the probability that this was the source. It is very likely that this UFO was Venus or Jupiter and it should be removed from the “Best Evidence” listing.